Signed lower right in light brown oil: JJ Henner. Two identical collection stamps on verso: Collection C. Chevalier (not in Lugt); inscribed in graphite: Musée du Petit Palais; in black felt tip: 6263. The present painting is a characteristic example of Henner’s singular technique, one where softly blurred forms are articulated by a visible underdrawing that may occasionally be read through transparencies or unpainted portions of his composition. present inanimate landscape constitutes a relatively rare exception. 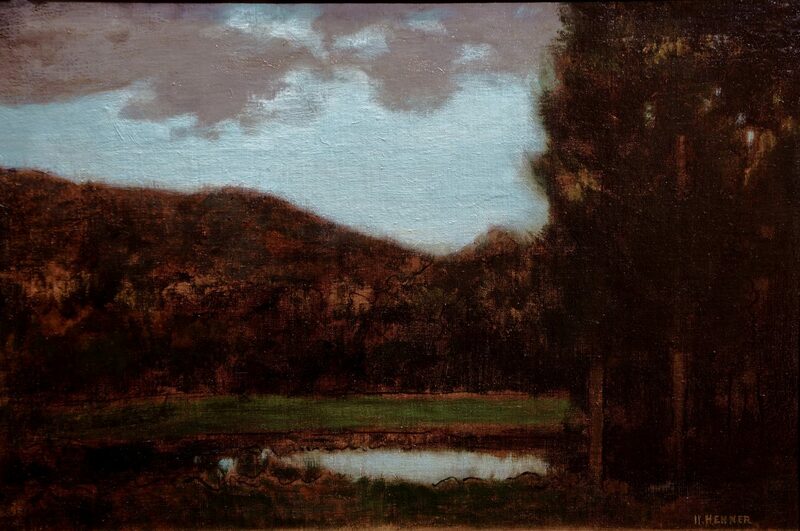 An evocation of the Munster Valley in the Southern Vosge mountains, by twilight, after the passage of a storm, encourages a classification of Henner as a painter of the Symbolist School. The subject of the Munster Valley is documented in four other versions, three in the Musée Henner, and an almost identical variant in the Musée du Petit Palais. All of them are dated tentatively to 1879.